hmm…interesting concept, Mo.I look forward to seeing what you do.Tactile imagery! It looks wondrous from here, but touch and dimensionality don’t translate well to cyber-viewing. Lucky us that we get to go along for the ride as I’m especially intrigued by how a felted sweater fits in to the mix! I will make the pattern and cut out the pieces after the Southerly Buster comes through & cools everything down this arvo, it’s HOT and it’s only 9am! Just as Nature is unique in each of its creations, so are we and what we create in our hands and mind. you are kind Susan but this one is definitely overwrought, a reflection of a very hot week that has cooked my brain! Mo, if you’re not happy with your urchin then you’re not happy. But it does look pretty cool sitting there in the last photo with the barrel and the skull. Oh, do I mean cool? No, we are all sweltering here but the wind is getting up and fingers crossed, that southerly buster really will happen. The urchin works better nestled next to Josh Harker’s “Crania anatomica filigree” It’s still so very hot, loved the photos of the pool! astounding creations in that last photograph! Your attention to detail work is always a wonder to me. this misbegotten one is so fussily Victorian, it reeks of spinster aunt busywork (not dismissing fine old Victorian lace but still there is something about it that is too … fussy) the next one is nearly a foot across! have cut out all the felt and will start stitching the edges this morning! it does ! I nearly gave up on the much bigger Mk3 yesterday as it looked like it was going to take way too long for a piece that has the potential to be both twee and kitsch but what the heck why not? 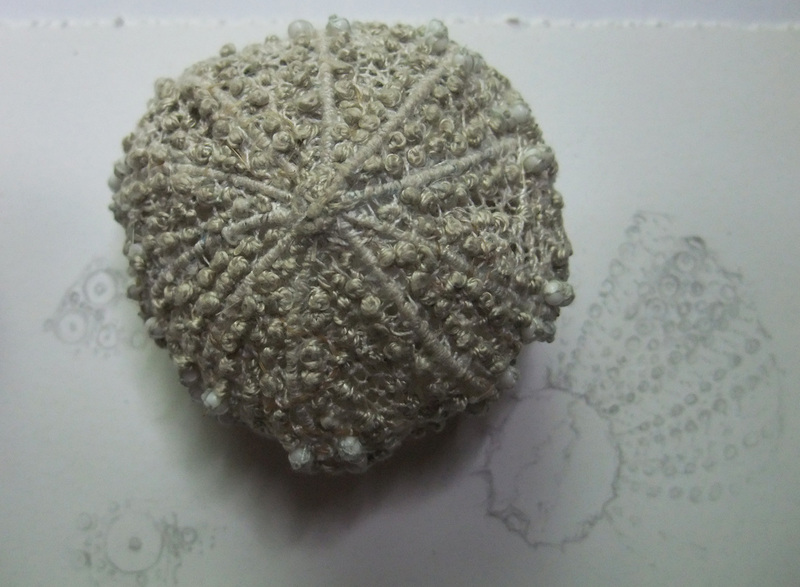 A moon urchin, a big fat moon urchin . . . I’m waiting. And summer? It hasn’t stayed here for more than a day or two. just cut the felted cardigan into 10 diamond shapes (like a flattened beach ball), such beautiful soft stuff, the needle glides through like butter, it’s been so bloody hot here, my brain melted down yesterday, the southerly buster finally kicked in at dusk and it’s a lot cooler today! 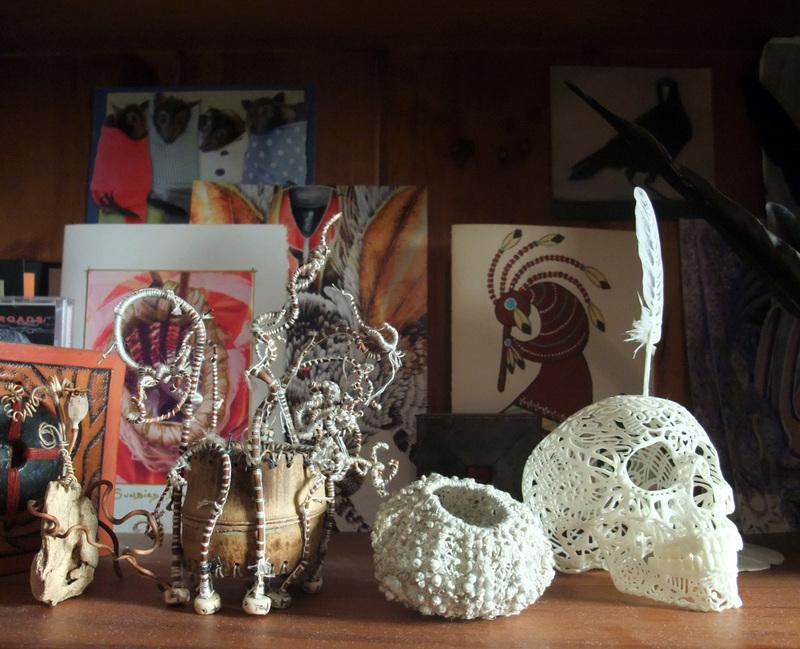 (((Susi))) am loving this new year of exploration through stitch & was surprised by the deeply visceral gut reaction yesterday when asked to exhibit the Crow Show again this year in a local library, realized how much I need this space to just explore with no particular destination in mind! While I think it is rich and beautiful, and would love to hold and feel it, I understand what you are feeling. I seem to overwork most of my paintings these days, think I’m enjoying the process too much, and then there was that ship last week that needed sinking in the end. I loved your shipwreck, disasters can take the work to places that were never intended but sometimes they can be quite exciting ! What maker hasn’t experienced that point of… I should have stopped… back there. I love that you are continuing though. 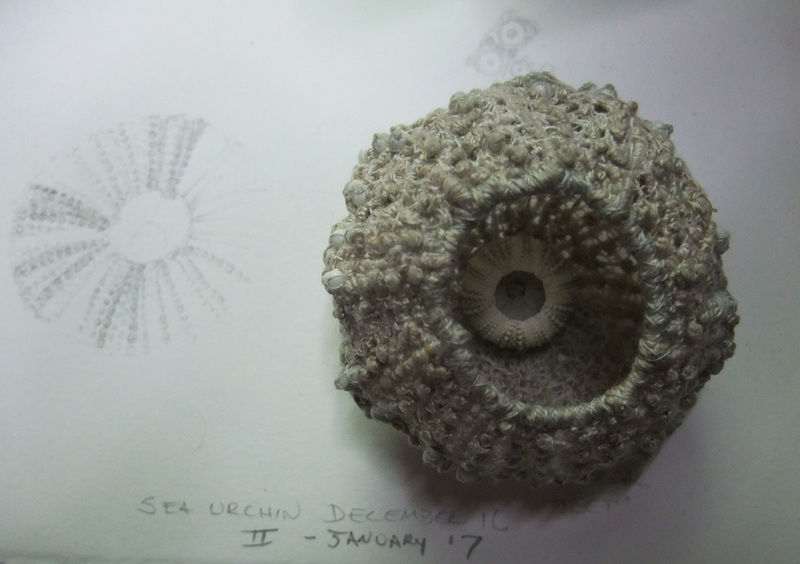 You will come to understand so much about the sea urchin. I understand what you mean it had lost its airiness but for me not its “sea urchiness”. It seemes to be heavy in contrast to the other things you create usually. From my point of view heavy has its good sides too in the meaning of strong. 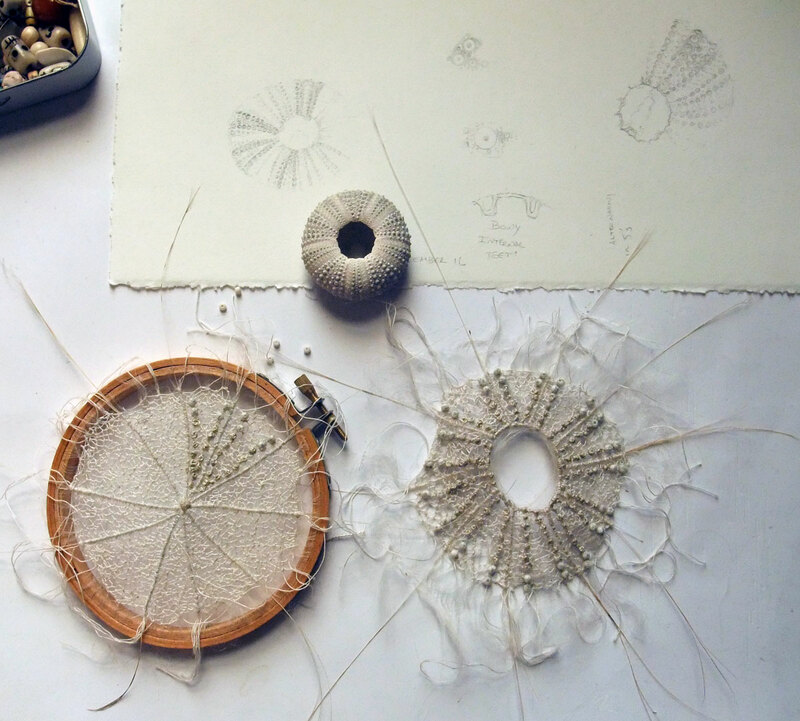 thank you Doris, sometimes how I think something should turn out gets in the way of seeing what’s really happening, yesterday I nearly trashed the rough beginnings of Sea Urchin III and then stopped myself… remembering to slow down, gently touch the surface and listen to the urchin! your sense of detail amazes me. you’re “just going” stitching through the thicks and thins of it all amazes and inspires me! (((Yvette))) slowly starting to see it for what it is in all it’s bumpiness & there are good things happening in Sea Urchin III! am curious to see where this new project will lead you…..
Oh my word! 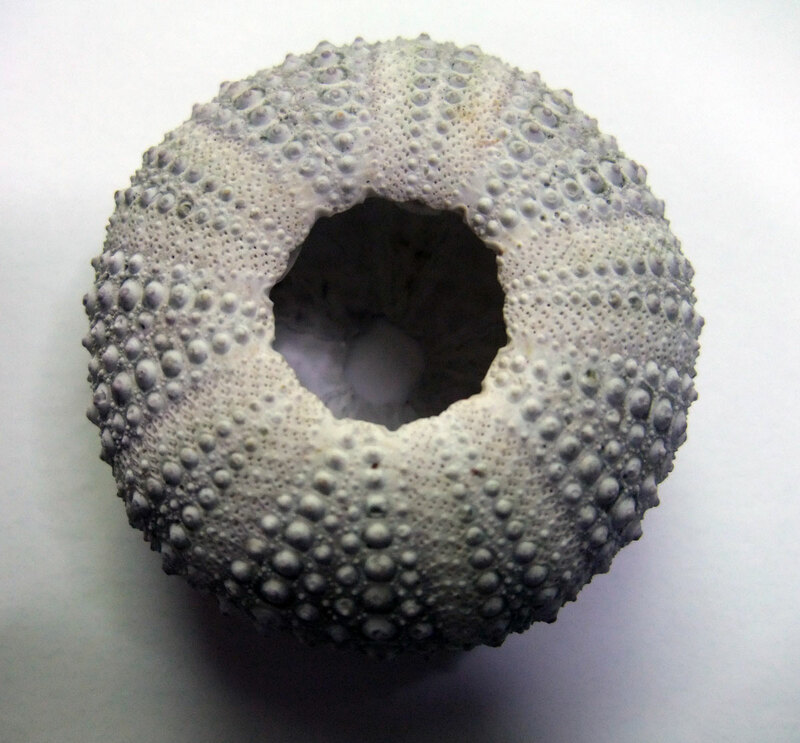 I’ve just discovered your sea urchin posts and am blown away. No spinster aunt busywork here. You are amazing Mo. I’m inspired!